Curtis, thanks for the info. I am enjoying it. Here is what happened on my place when I buried some fermented corn. I fermented some corn in a closed 5 gallon container with a little water, a can of cheap beer and a few eggs and some milk, let it sit in the sun for a couple weeks. I then take a post hole digger and dig down as deep as I can(about 5 feet) fill the hole half way with corn and cover with dirt, Next morning, crater! but most importantly father to my two girls ! Last night proved to be a bust for piggies. It appears that only one lone boar showed up. He ate at one feeder but didn't touch the rubs. 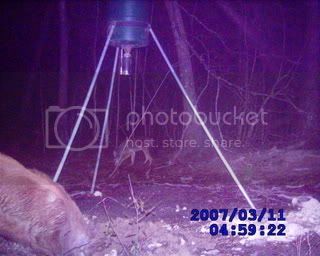 The camera was watching one of the rubs and didn't capture anything but more racoons. Maybe tonight will be better. Here is Mickys daily pic. Mid-day pig cooling in a water hole. This shows what I was saying about hogs needing water in the day time. I just read a very informative article from Wild Boar USA Magazine which states that the piebald or spotted features on white hogs is produced through inbreeding of hog packs. I never knew this and have sought the spotted pigs over other colorations for years. Now I find out that I've been hunting inbred retarded hogs????? Here is one Charlie Lamb shot a few years ago while night hunting my home property. He's the original "inbred" killer! Another observation: Yesterday I was observing BoBo and Dozer feeding under a Mullberry tree. The Mullberries are falling so thick that they are a literal carpet across the ground. What I saw was BoBo and Dozer not eating all the berries but actually being selective. They would sniff the berries for ripeness. They would pass many berries to find just the right ones then pick them up with their nimble lips without busting them. BoBo is so nimble with his lips that he actually takes single kernels of corn from me and never touches my fingers. They have incredible dexterity with their lips. Another fact I've come to realize: No poop! I've been on many ranches which were lacking in hog poop even though there were high concentrations of hogs. So, why no poop? If ya have hogs ya should have poop, right? Not so! Hogs only digest about 30% of what they eat and the rest goes though without getting utilized. What does this mean? Well, essentially there are food piles laying around after a pig poops. Now, I've been on some ranches where there was literally piggy poop everywhere so what's the difference. Humm? Maybe this guy! Is that an American Bulldog? Very good post! Keep it up! Nope! That's my precious female Boxer, Missy. Great thread CK, I just may no a little more than they make bacon out of them! After this one! Think I'll leave that piggy poop for Charlie. I know you've got all sorts of testing going on; do you plan to try different orientations on the rub posts; posts standing vertical vs laying on the ground? Haven't thought about it until you started this thread but the domestic hogs I've seen seem to prefer rubbing on vertical posts. Keep it up, I'll be watching for more results. Nice post and commentary CK! Have you tried just gasoil in a tree? Here it works awesome!! Nice post, keep it coming! How many pixels has your trail cam? Will be trying diesel next. Last night I threw sour corn around the commercial product to be sure I drew them in close. Here's the series of events in quick time. A total of 10 minutes start to finish. Have a look. Never heard the one about pig inbreeding before. Interesting. They are not only nimble with their lips they are quick. One time while hunting in Texas we had corned a sendero with a broadcast system (not dribbled but cast so it went edge to edge..think grass seed spreader). 4 small hogs came down the sendero shoulder to shoulder at a mans trotting pace vacuming up every kernal, cleaned the whole road in about 2 mins. Growing up on a pig farm, we always knew where to find the pigs in summer. Either in the pond or under the brush/shade trees around the pond. I can't imagine the the wild ones would be any different from that. I've never heard that about spotted pigs either. Interesting idea. I wonder how they came up with that. If that is in fact the case, some of the island habitats should be full of spotted pigs. Anybody know if that is the case? How about it? Any of you South Georgia boys see more spotted pigs on the islands out there? Black is the dominant color around Glynn County. Brown/Red being second, and lastly the spotted ones. Either black/white or red/white. Most of the islands I hunt are not really geographically isolated. Small rivers to swim. I don't think they stop the hogs from moving when they want to. I didn't claw my way to the top of the food chain to eat vegetables!